C-Evo Game - Download and Play Free Version! Build a Society From Ancient Times That Prospers Through the Centuries. Free Civilization Type Strategy Game! Start from the simple trappings of a tribal leader and guide your people through the centuries as you try to create a world power. Build cities, control strategic resources, research new technology, and create an army to vanquish your enemies. 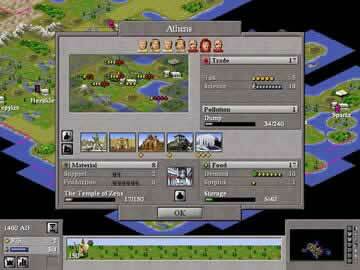 C-Evo is a freeware empire building game along the lines of the Civilization series. Span several thousands years as you control all aspects of your chosen people, such as exploration and expansion, industry and agriculture, warfare and diplomacy, science and administration. Experience the same popular turn-based strategy from the mid 90s, but with even more emphasis on powerful AI and careful design of the rules. 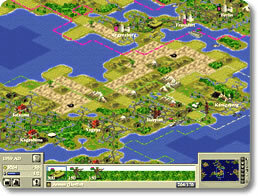 If you have never played a Civilization game or other turn-based strategy title, the main gameplay occurs on a gridded map. At the beginning you start out with one city or settler unit, which is used to found a city, and usually one warrior type unit. Each unit can only move a set number of tiles per turn and each city can only build one improvement or unit at a time. The game then progresses with each player performing all their actions in one turn before passing control on to the next civilization. C-Evo is quite a bit more difficult though since you do not automatically get to build all units that come with your known technologies. Instead, you have to research each unit and assign attack, defense, movement, extra bonus-points and various other statistics before it can be open for production. Fans of turn-based strategy games will instantly enjoy the complex gameplay of C-Evo. Be it fine tuning your units to working at the Space Race win condition, there are tons of avenues to explore in this exciting game. Additionally, there are already several mods available for the game including different AIs, different tribes, new tech trees, and you can even change the look of the terrain and units. There are endless possibilities to explore and enhance the already fantastic gameplay. 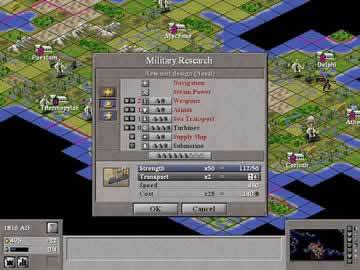 So if you like turn-based strategy games, download C-Evo and start your very own civilization today!